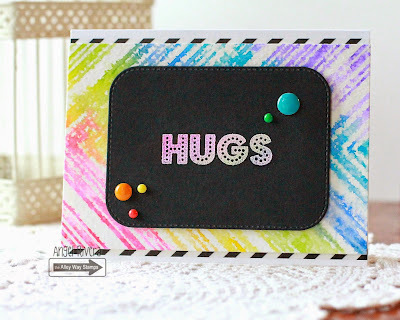 The Alley Way Stamps: June Sneak Peek Day 1: Lite Brite: Win it!!!! June Sneak Peek Day 1: Lite Brite: Win it!!!! Today is finally here! Day ONE of the June Sneaks!!!! Click on the Rafflecopter widget below to enter to win this set - Lite Brite !!! ! You have until 7 pm TAWS time tonight to get your entries in! For our friends that do not have Social Media accounts, you can also just comment below. We will randomly pick commenters for our giveaways, too! This contest will run TODAY only (5/28/15), but we will have another giveaway tomorrow! Hi it's N@ Ali. Something a bit different from me today, bright colours and gold ; ) The sentiment is a combination from Lite Brite and Big Chatter, the owl from Moosing You and the arrows from Tag-Alongs. Hi all! Angel here with a card using the new Lite Brite stamp set! As a kid who grew up in the 70s/80s, I love the name and loved my Lite Brite back in the day! For the background I used the Line Upon Line background stamp to add to the retro feel. Hi! 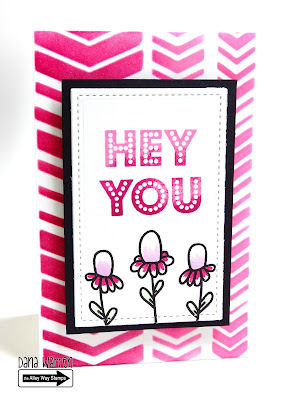 Joanna here, this is not a sneak peek, this is a shaker card I created with Cake Day, an older set. Check out the video if you would like to know how I created it! Love the Lite Brite stamp set. I remember how much my sister liked her Lite Brite set. Fabulous cards. What a fun stamp set! Love it!! Wonderful inspiration, including the fun shaker card. Looks like the Lite Brite set is going to be a real must have. Thank you for the chance to win. i love TAWS Stamps so much ! I just love all of your stamps and can't wait to see the new releases! Thanks for the chance to win! Great cards...the sentiment set looks awesome. Thank you for the chance to win this fantastic set. I love the cards!!! I've been working in the yard and I'm hot and sweaty. that ice cream cone looks delicious. Wish I had one right now. Can't wait to see the rest of the release! 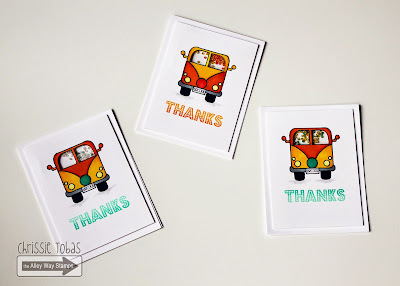 Love those shaker cards made to look like school buses! I'm such a fan of your stamp sets. Love your critters the bestest and especially the ones from the ocean like, Sea Mates, Gill Friends, All Washed Up, and Little Fellas. Loved Mrs Rogers Neighbrhood too for all the hometown feel!! Can't wait to see your new sneak peeks!! Great shaker card on Youtube as well!! Love the versatility in that set! Lite Brite was my all time favorite toy! Who knows....it could have been the start of my love of creating! Fab projects ladies! First I love the name of this set! I remember having a Lite Bright! Such a fun font! Great cards! Love the shaker card! Awesome DT cards, I love the shaker cards! Fun, fun, fun cards. 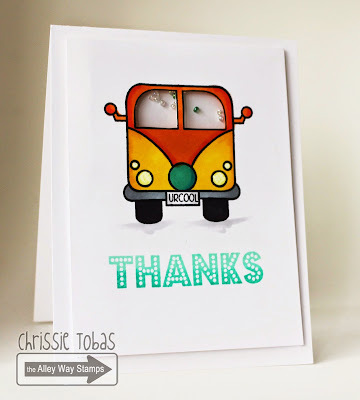 Lovin' the VW Bus! Love the VW Bus! Such a cool shaker! The name, Lite Brite, is fun, Alley Way stamps are always awesome, so the new Lite Brite stamps have to be simply amazing!! Such fun cards! 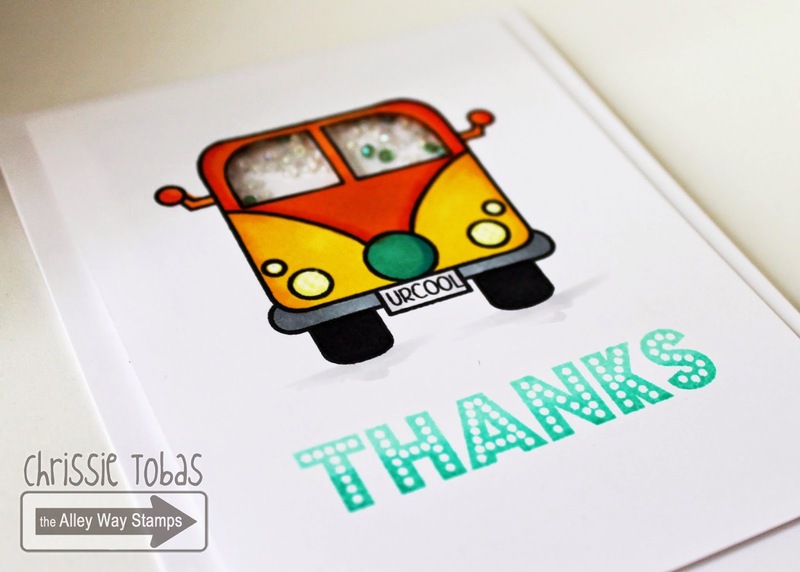 I love colouring your stamps! The Lite Brite set would be a great addition to my addiction...love the look! What fantastic cards!!! Love them all and this set looks amazing! What a fun new set and all these samples of the new stamps are so great!!! June Sneak Peek Day 3: Twinkle Toes: WIN IT! June Sneak Peek Day 2: Slurp: Win it!!!! 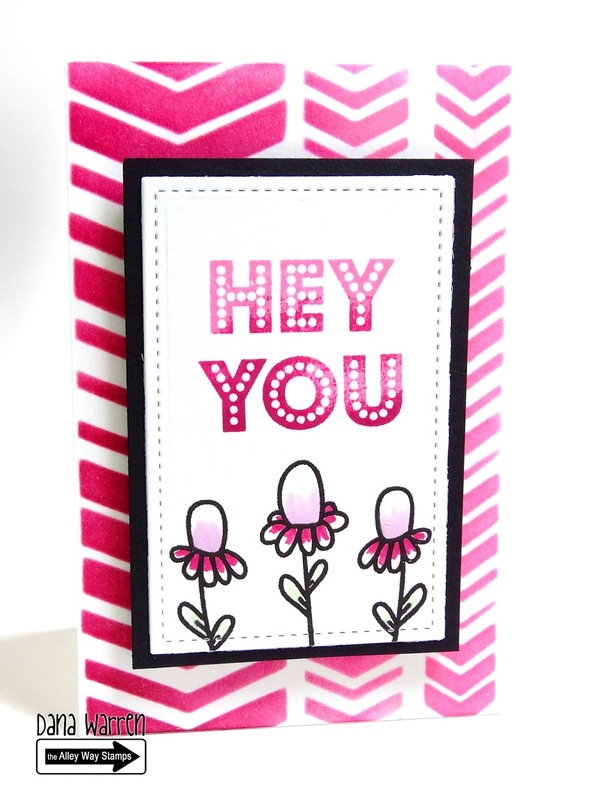 Warm Retro Fuzzies (video) and A Guest Designer!